Hubert ‘Oppy’ Opperman was a sporting icon, a cycling phenomenon whose epic feats of endurance captivated the cycling world. For over two decades, he dominated almost every race he entered and shattered record after record in Australia and Great Britain. In 1928, he led the first Australasian team to ever contest the Tour de France. But Oppy was more than a just a champion. During the Great Depression, a time of painful economic and social change, he became a transcendent symbol of Australian fortitude. He became a household name, a legend — as popular as the cricketer Don Bradman and the racehorse Phar Lap. Until now, Oppy has never been the subject of a complete biography. By peeling away decades of mythology, Daniel Oakman tells Opperman’s story like never before. 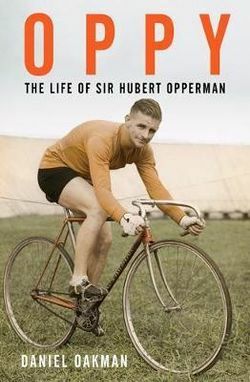 As well as vividly retelling his sporting triumphs, this book is the first to consider the legacy of Opperman’s post-cycling career. It explores the emotional pain of his private life, the controversies that dogged his seventeen-year political career, including his term as Minister of Immigration in the Menzies Government and the remarkable and far-reaching changes he helped bring to Australian immigration policy. Daniel Oakman is a curator, historian and bike rider. He has curated exhibitions about bikes, cars, cities and urban design; including Freewheeling, a ground-breaking travelling exhibition on cycling in Australia. Daniel writes about cycling, sport, social history and politics. His first book, Facing Asia, was shortlisted for the NSW Premier’s History Awards. He lives in Canberra with his partner Cecilie and a dog called Gilbert.